Having unveiled the past's mundane Wizard's promises of spiritual quick-fix through 'sacred practices' we can now choose to invest our time in building a meaningful spiritual practice. A few days ago I set out in my car on a road trip. I had my iPod set on shuffle. 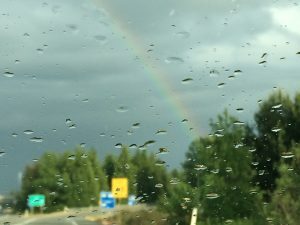 As I left the border crossing behind and hit the open highway, The Mighty Clouds of Joy came on, singing 'He's My Saviour in the Storm': and from the bottom right of my view, the most remarkable rainbow arced fully over the highway; it remained in my forward view for a full hour and a half, until the sun set. How so the passage of time keeps us treading in the same spot while simultaneously providing new frames of reference. In particular, I recall those decades of fantabulous mind-bending alternative reality discoveries most of us we Boomers survived, during the '1960's-'80's. Those fantasmagoric new realities included the reflective internal arts of the Far East: meditation, Buddhism, the martial arts, and Taoism. What I am discovering is that although they are sound and powerful tools to self-knowledge, their applications back in those turbulent days of change in North America were less so. In fact, the fashionable gravitation towards anything novel and unlike what our parents did ultimately led to accepting ersatz versions of the original practices. Despite this we still ingested digested and distilled versions of practices which by their very nature required patient, slow, disciplined commitment and engagement. In other words, we were engaging with these foreign practices and yet remaining just as we were; always looking for a quick fix for ourselves. The disillusionment is palpable for most Boomers I meet with. We live in a new era of people long disenfranchised from organized religions and faith practices; and worse, have witnessed the unveiled, mundane wizards behind the curtains who manipulated the counterculture's 'sacred practices' for their own commercialized success. Examples include the proliferation of entrepreneurism in yoga wear, their requisite slogans to encourage you to go to class (and look good at the same time), or the exposure of the empty teachings of Transcendental Meditation, and the leadership of the Bikram yoga franchise. The irony of this is our ongoing belief in instant fixes through these practices. Now, every mainstream medical and healthcare clinician is prescribing meditation, yoga, and tai chi as exercises for body and mind, fuelling an open and unregulated market of teachers and gurus. In each of these settings, nothing new is being gained. The value of these ancient Eastern arts is that they are arts. They are not the equivalent of circuit training, riding an exercise bike, or doing a set of calisthenics with a qualified trainer. The oriental arts are not primarily meant to develop the body; they are meant to develop the mind through engagement with the body. This takes more than a prescription for lessons and not only repeating physical movements, but also understanding them. Why would a Jewish Chaplain be writing about this? And why now? I am noticing a trend in both the public media and in my practice that people are really stressed in general, which is nothing new. What is new is that we have lost our way as a society; we have lost or eschewed a reliable source to turn to when the going goes from everyday stressful into crisis. How does it look when you are navigating a full time salaried day job or being a full time homemaker with all the work and busy-ness these require, and now you have a cancer diagnosis? Or your beloved father dies unexpectedly, or your child. Or your spouse tells you over dinner they are leaving and want a divorce. Now what? People in general do not live in standby mode, ready and prepared for these things, unless they have some fear-based drives to live that way. In times of trust in faith, we grew up knowing, because everyone believed it so, that going to church or temple would provide a framework for navigating these rough times. Unfortunately, even these places succumbed to the lightness of empty experience. Boomers have created alternative rituals in yoga studios, the gym to be buff, to karate to earn a black belt, or doing drugs with friends and we got lost in Transcendental Meditation. These activities certainly have their value, but will they provide a source to turn to when the ordinary becomes unbearable? I recall sitting with a friend many years ago. I was always impressed at how she had the wherewithal to be self-sustaining in her own private healthcare clinical practice. Yet, as we talked, she told me about her husband's long history of drinking and how she no longer came home to find him adorably rummy; he was now impossible to be around. She and her adult children were in a crisis: there was no where to go for answers, for comfort, for directions out of this mess. She thought about closing her practice and just leaving the country altogether on her own. But what she really wanted to tell me was how much she regretted not having been part of a religion and having instead brought up her children without any sort of religious practice; no Sunday school, no weekly worship, no way of sorting out the deep questions and suffering they were all going through. She wanted to talk to me because my family did do those things and had built a spiritual foundation to turn to should we need it. For her and her family, it was a long road to embark upon on top of trying to cope on a daily basis. I encouraged her to invest herself and take the first steps anyway, acknowledging that it was certainly simpler to just escape. Other manifestations of the '60-'80's indulgences of the Boomers include the continued belief that change can be instantaneous. We still want instant nirvana or enlightenment. And, being proud North Americans, someone will assure us that if we desire it, we can create it. We have moved somewhat beyond Timothy Leary and the promise of instant knowledge of the universe in a single tab of LSD; we now know that won't happen. In fact what we have gained from that belief is a serious national problem with intravenous drug addiction and HIV/AIDS. Back to that sunset with rainbow and gospel song. Not to parallel my new-found rainbow in the sky with the strawberry-fields-forever of the rock 'n' roll era, but to say that there are important and life-altering convergences that go on in our lives all the time. We are too busy looking for a quick fix to see them. Even the experiencing of these ephemeral convergences has been co-opted. Synchronicities, the unbidden and mundane convergences that are life altering moments, ironically have lost their effect toward change by becoming something we actively seek. What the Eastern arts were originally designed for was to train ourselves through various practices to be able to notice those convergences. 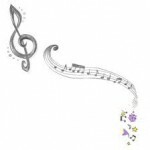 These moments of grace are natural occurrences that we observe only in the subtlety of quiet availability, developed over time, the same way that learning to play a piano gracefully and with satisfaction takes time and engagement. Or in navigating the features of a computer, or learning to speak as an infant, or learning a new language. Do you remember your first steps as an infant? Probably not, but you have likely watched a baby taking first steps, and then the months and years to learn coordination and mastery of physical movements. It is the same with our spiritual growth. There is no quick fix or quick lesson for that. If anyone tries to sell you that, fire them. And certainly don't seek it, or you will find yourself with that familiar pastey taste in your mouth, disillusioned and empty after investing in a shortcut lesson in enlightenment. I once took a meditation class at my local community centre. The instructor talked constantly for over an hour, and even after we finally got 10 minutes to sit quietly to try meditation, she gabbed at us about how marvellous serenity was. Instead of relaxing, all I wanted to do was shout at her, "You need to take a meditation class to learn to be quiet!" These arts require knowledge as well as practice. On the outside we may look right with the right clothes, cushions, prayer books and garb, gee and slippers, but the deepening of the art comes from understanding what the path or process is and matching that information with how you do it. For example, tai chi is actually tai chi ch'uan, a martial art, and as such is meant as a means of cultivating focus for your inner strength. It may appear to be a lovely free flowing improvisational dance because of the gracefulness of one who is fully engaged in the movements, but each movement is actually the review of a lesson in focusing a neutralizing or deadly defensive move against an attacker. When you have found your practice, whether it is prayer at a conventional religious community, meditation, martial art, creating music or a garden, you will have developed a sensitivity that invites meaningful moments that seem like nirvana. 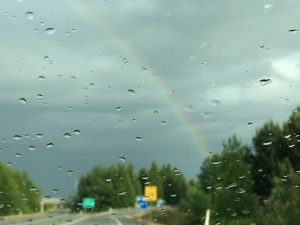 The moment I heard the gospel song and saw the rainbow appear as I sped onto the highway of a new country, the world shifted. I no longer worried about anything; I let go of everything because suddenly everything made sense. I felt a rush of gratitude for this unbidden moment of grace or deliverance at just the moment the song beckoned the listener to thank God. I was grateful that I had allowed myself the faculties to sensitivity to recognize the moment. I thought of the Beatles' song, 'The Fool on the Hill', and felt how glad I was to have been that fool, regularly setting foot in my spiritual practices and studies knowing there is no instant fix.